Reformers are counting on shareholders to rein in compensation. But big investors seem inclined to remain quiet and preserve the status quo. 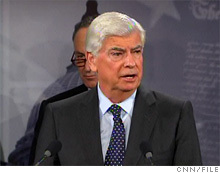 Sen. Chris Dodd would give shareholders a nonbinding vote on executive pay. NEW YORK (Fortune) -- Waiting for investors to slam the breaks on runaway executive pay? Don't hold your breath. Although Congress may give shareholders more of a say on pay soon, big money managers seem content to keep their mouths shut. Senate Banking Committee Chairman Chris Dodd, D.-Conn., unveiled a financial reform plan this month that would give investors in public companies an advisory vote on pay policies starting in 2011. It's the latest boost for say-on-pay plans, which reformers have been pushing in recent years with some notable support. The idea is that shareholders, as the owners of public companies and the natural guardians of the corporate purse, will pressure directors to hold the line on pay -- particularly at underperforming firms. President Obama has backed making say on pay mandatory. More than two dozen companies, including Verizon and Microsoft, have adopted the plans. Say on pay seems particularly appealing now, as Wall Street firms prepare to pay out huge bonuses at a time of high unemployment and massive taxpayer-funded subsidies for the economy. But there's a catch. The biggest investors -- institutions such as mutual funds and pension funds that hold more than half of all shares -- have shown little interest in playing pay watchdog. And it's not clear that will change even if the government mandates say on pay as part of the financial reform taking shape in Washington. "We just haven't seen a huge amount of effort being put out by institutional shareholders to affect compensation levels," said Bernard Black, a law professor at the University of Texas. "Whether it's because they don't mind the pay practices or because the money managers are making millions themselves, you don't see them jumping up and down." Black notes that institutions rarely try to elect their own candidates to boards or take other actions that might be classified as shareholder activism. But critics go further. A recent study co-sponsored by a union pension fund and a top governance firm dubs many of the biggest mutual fund firms -- including Ameriprise, AllianceBernstein, Barclays and MFS -- as "pay enablers" for supporting management pay proposals and opposing those by shareholders. The report, co-sponsored by the Corporate Library and the American Federation of State, County and Municipal Employees (AFSCME), chastised the funds for "failing to use their voting power in ways that would limit compensation excesses." MFS disagreed with these findings. The closely held Boston-based firm said the study "did not truly reflect the firm's position on executive compensation." The fund firm added that since 2007, it "has determined excessive executive compensation at over 70 issuers and has not supported over 200 directors due to excessive executive compensation concerns." MFS hasn't been a fixture on the pay enabler list. But Ameriprise, AllianceBernstein and Barclays have made it each of the last four years, the report said. These firms didn't respond to requests for comment, but Richard Ferlauto, who directs corporate governance and pension investment at AFSCME, said it's clear they aren't looking out for their customers. "The funds have an obligation to their investors to monitor the performance and the practices of their holdings," he said. "Had there been more rigor on the part of these funds in reviewing their investments, some of the worst problems of this downturn could have been avoided." Eleanor Bloxham, who runs the Value Alliance corporate governance firm in Westerville, Ohio, said big shareholders don't tend to take an active role in overseeing pay because the industry is rife with conflicts of interest. "Everyone is in the same boat in the financial services business, as suppliers and customers and 401(k) holders," she said. "There is no great will to stand up." By the same token, researchers say cost-benefit analyses often make activism less attractive to institutional shareholders. Big firms often hold thousands of stocks in giant diversified portfolios, making intensive monitoring a major chore. "I'm not one who believes corporate governance will solve our problems," said Margaret Blair, a law professor at Vanderbilt University in Nashville, Tenn. "Shareholders are not in position to address the main problem, which is the incentives we are giving to management." Still, for all its limitations, say on pay is widely acknowledged to be better than one oft-mentioned alternative -- greater pay regulation. "At most, say on pay might bring down some of the biggest paychecks. But I don't see how that's such a great threat to capitalism," Black said. © 2009 Cable News Network. A Time Warner Company ALL RIGHTS RESERVED.